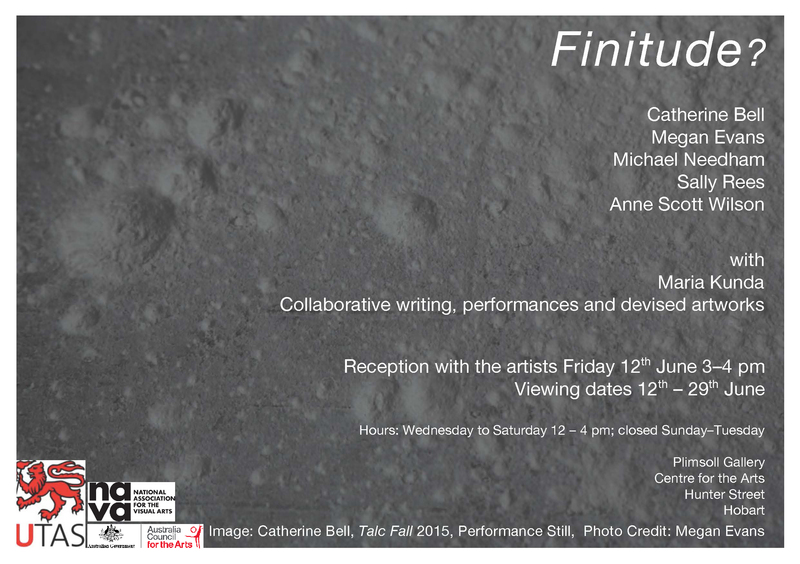 The Finitude Project is an ongoing collective art enquiry that explores creative practice-as-research by a group of Australian artists/academics. Its origins are based on common research interests, namely, a theme of death and finality as a recurring provocation, along with broader concerns regarding limitation in representation and contemporary creative practice. It is through articulating and analysing crossovers between individual practices, that The Finitude Project becomes a dynamic research model for collaborative practice in its own right. The Finitude Project has identified that theoretical and practical synergies connecting artworks is not only pivotal to collective practice, but it is a means of redefining existing approaches to studio led-research methodology and to its curation in visual, exhibition outcomes. It is a conflation of research and process, facilitated by re-visited conversations occurring before, during and after artworks are created. By looking for complimentary creative scholarship, generating and transforming ideas, images, theories etc., such dialogic exchange directly positions itself to glean from and contribute within interdisciplinary and transdisciplinary perspectives. The Finitude Project is also motivated by questions that underpin our roles as academics and artists within a University setting. We will explore how an interactive practice can be utilised as an educational model. We question how an inclusive, collective approach to studio-led research could enhance students' experience of practice-led research within the institution. A primary aim for our collaborative practice is its development as a site of knowledge production and as a dialogic approach to teaching and research that can challenge traditional genres and question accepted academic practice in the visual disciplines. Examining how our collective model both continues traditional solo research and extends it by incorporating the ephemeral and prepared works simultaneously is an ongoing interrogation. Responding to philosophical and conceptual provocations the collective's method enables ongoing exploration rather than seeing the exhibition as the end product of practice-led research and allows for development of ways of sharing what is usually an isolated process in educational settings.